Are you enjoying the new photopolymer stamps in My Paper Pumpkin kits?!? 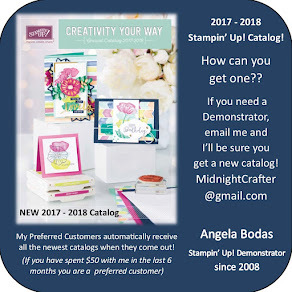 It took Stampin' Up! a while to develop a clear stamp that met their high standards, but once they found photo polymer! Woohoo! Off & RUNNING! Clearly Awesome! Enjoy a TON of images for a great price!! "Our top-quality photopolymer has just enough give to create a perfectly stamped image every time and with the introduction of our firm-foam pads, let's just say they're meant for each other! Photopolymer stamps will also be unique, fun designs that will inspire you and provide more versatile options you may not see in our traditional wood- and clear-mount stamp options. We could go on, but we'll let you try them for yourself." The Show and Tell Stamp sets 1 and 2 are great for creating backgrounds for your scrapbook layouts, cute gift tags, gift bags, or home decor. 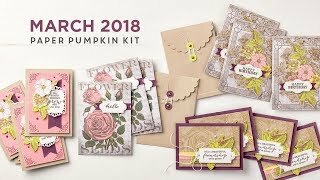 They have some cute little accent pieces that will work with many of the traditional stamp sets offered in the catalogs, as well as many of the kits and Designer Series Paper. When you purchase the online class (What?! Online Classes?!? YES!! ), you'll learn how quickly and easily you can line up stamped images for precision placement, achieve the right ink coverage, combine images together exactly where you want them, and more! Class features the Show & Tell 1 and 2 Stamp Sets, and includes six lessons (Backgrounds, Building, Layering, Versatility, Gift Giving, and Memory Keeping), step-out photos, instructional videos, and instructions and supply lists for 15 projects! I will definitely be sharing more about these awesome sets, they are really impressive! I hope you're enjoying them AND your Paper Pumpkin kits!